As a wedding gift, we got a new but retro-looking pressure cooker from my in-laws. I think my mother-in-law worries that I spend too much time in the kitchen-and wanted me to know the glories of time0-saving when using this device. Never having used a pressure cooker, I had to learn how to even put the lid on! (Madam, don't you worry!) For me, the image of an apron-clad 1950s Argentinean housewife pops into my head-she's rushing around, trying to get dinner on the table, frazzled to bits. She's a woman with family responsibilities, who could always use an extra hour and an extra hand (oh, wait-I'm not supposed to be describing myself here-oops!) and then the Amazing Pressure Cooker whisks in to save the day, restoring calm, tranquility, and a beaming smile to the housewife. Ahhhhhh. The pressure cooker really can save time, especially when cooking things that otherwise take too long to make-like beets, for example. Rather than boil beets for an hour, put them in the pressure cooker for 20 minutes. See? No worrie, madam! I'm still working on mastering the greatness of the pressure cooker, though-it's a process. My mother-in-law serves this very simple and very delicious salad at lunch or dinner. 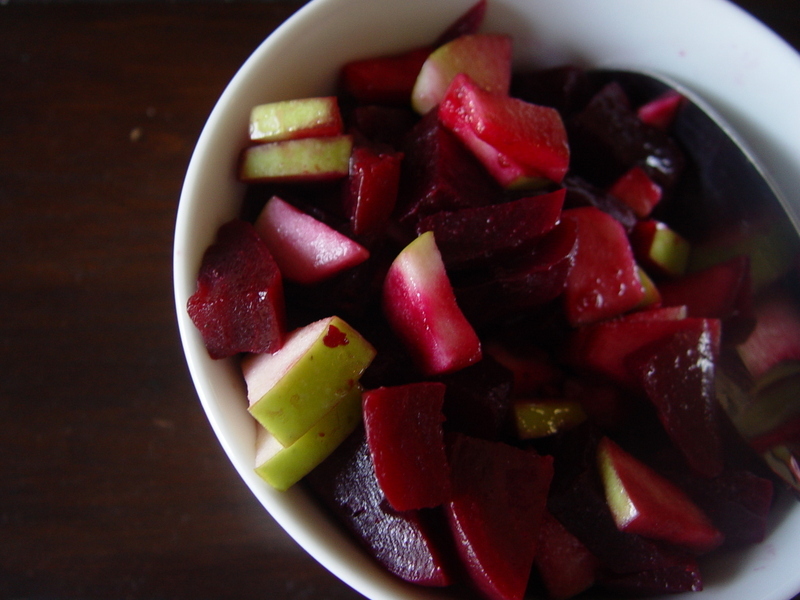 It combines beets and green apples, and it couldn't be easier or quicker to prepare. The combination of the earthy taste of the beets and the tangy flavor of the apple is a tasty combination, and visually, it's beautiful, too-the jewel-color of the beets bleed onto the white of the apple. It makes a welcome change from the typical green salad, and is the perfect dish to take along to a pot-luck. Peel and boil the beets until soft when pierced with a fork. Cut the beets into bite-sized pieces. Core the apple and cut into bite sized pieces. 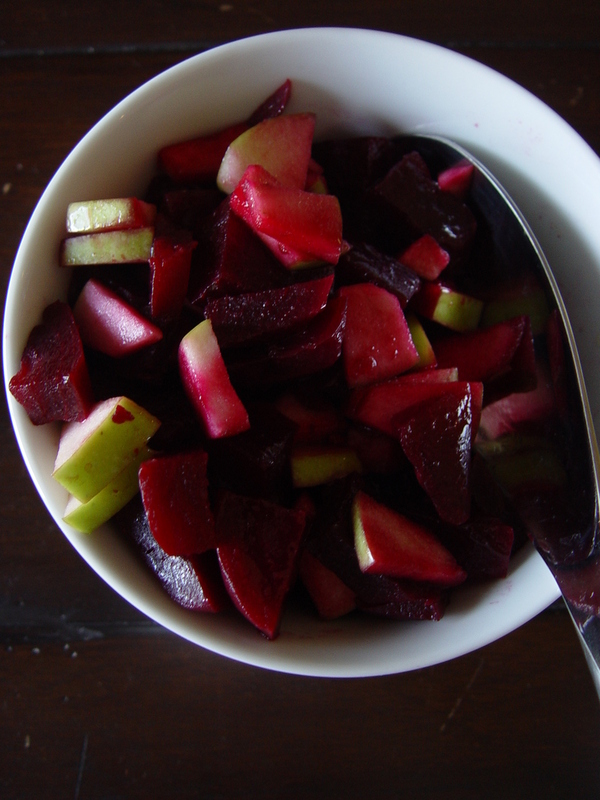 Stir the beets and apples together in a medium sized bowl. Drizzle with oil, just enough to coat the salad. Squeeze the lemon over all, and add salt to taste. Stir to combine. Transfer to a serving bowl. Can be served cold or at room temperature. How exciting to see my adopted home there, I stayed glued to the TV the whole time. And in fact, the whole show was dedicated to Argentina and its culture. They did a segment on drinking mate, on the gaucho (including a truly incredible video of a real horse whisperer!) Matt had a tango lesson, watched an artist paint in the fileteado style, and toured Buenos Aires. All the clips are available on the Today Show site, so if you missed it and want to watch, log on and get your free tour of Buenos Aires! It made me want to book my flight now! A side note: The correspondent that did the bulk of the stories, Kerry Sanders, had obviously (like me) fallen in love with Argentina. He handled the topics of Argentina's culture wonderfully and gracefully-and with respect. Here is a clip from the show of Patagonian born, French trained celeb chef/restaurateur Francis Mallmann giving Matt Lauer a brief over-view of Argentina's classic cuisine. Guillermo and I have watched it over and over, drooling! You may have noticed that the sidebar items on this site have changed recently! I joined the ad network at foodbuzz as one of their Featured Publishers, and I'm excited to be working with them and networking with other food bloggers. I've also added links to an Argentinean book, movie and music selection that I enjoy-I hope that you enjoy them, too! You can follow the link and order them directly from Amazon or get more information. The movie is Nueve Reinas (Nine Queens), a thriller in the style of Ocean's Eleven about con men conning con men in a heist of some rare stamps. This story within a story shows classic scenes of Buenos Aires life, too. Sunday afternoon. 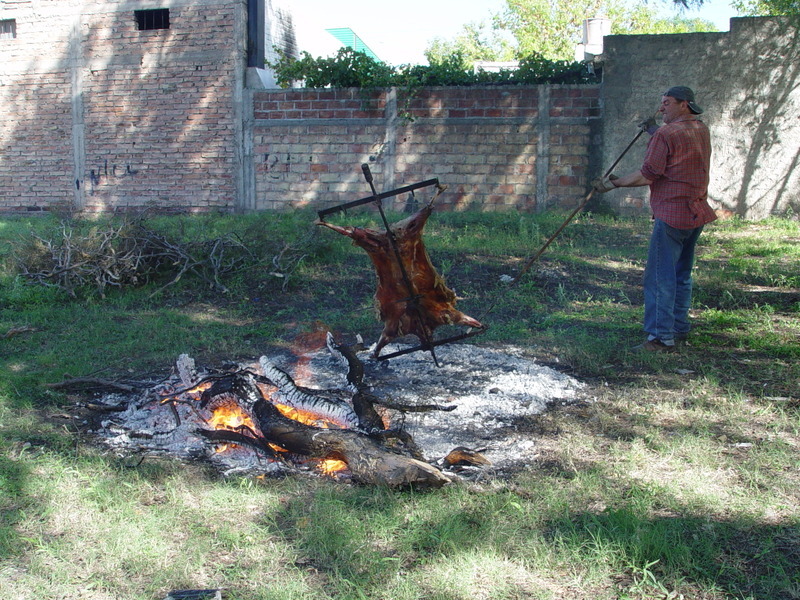 The smoky smell of asado (barbecue) is in the air, drifting over from the neighbor's house. People walking down the street seem to stop and sniff the air. It's late summer in Argentina, and there's no better way to spend a Sunday than barbecuing with friends and family. "It's a guy barbecuing..." says my husband, as if it's nothing unusual to see a blazing fire right out in the open as you're driving down the street. Yup. A guy, in a vacant lot, barbecuing a whole goat, over an open fire, on a Sunday morning. My American brain said: In an open lot? And he hasn't been arrested? Or, no one has called the fire department? No news crew has come out to cover the story about the lunatic who decided to light a fire in an open space and barbecue a whole goat? Nope. The only thing people are doing is walking by, admiring the goat and the blaze, sniffing the air, and hoping for an invitation. Of course I made my father-in-law drive around the block again and stop. 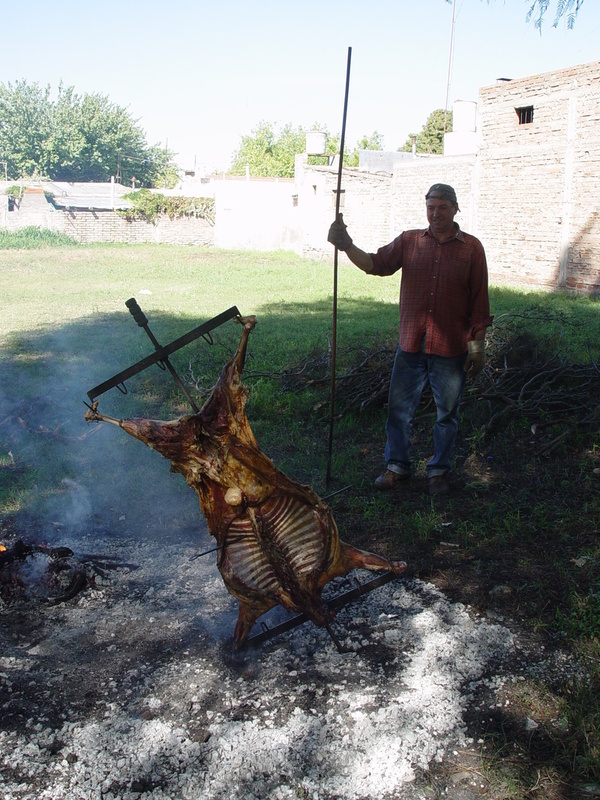 Argentineans are so proud of their culture and are totally willing to share it-this man was delighted. He happily shared his techniques on the perfect barbecue and let me shoot some pictures. He's very dedicated-he goes out to the forested area outside of General Alvear in the early morning-around 5am-to collect the scrub pine branches he uses for the asado. 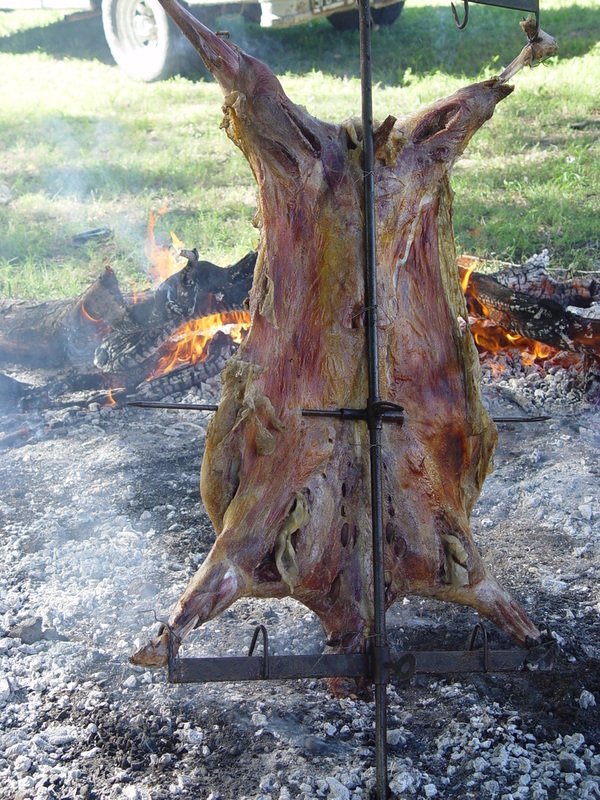 He uses pine for its fragrance and the special flavor the pine smoke adds to the meat. He uses larger logs for the real heat of the fire. Using a long iron rod, the coals are moved around and the fire stoked so that the meat is cooked evenly. The meat (in this case, a whole goat) is fixed onto an iron rack, (I know-it resembles a medieval torture device!) splaying the goat open flat. The rack rotates on the iron bar stuck into the ground, making it like a spit, so the meat can be turned periodically to get more or less heat. 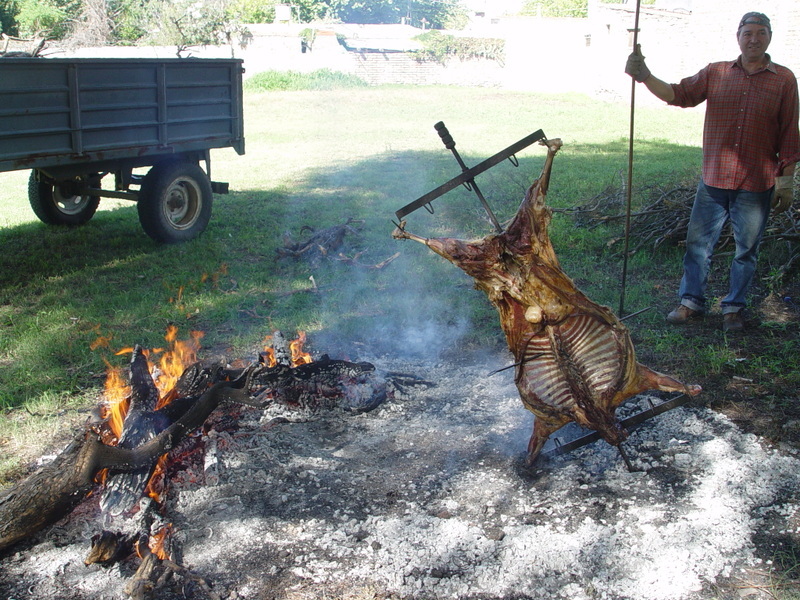 This is truly a labor of love-from collecting the pine branches for the fire, preparing and racking the meat, and cooking it over an open flame-the cooking process itself takes over 4 hours-Argentineans are dedicated to (and famous for) their barbecue. This man took such obvious pleasure in spending his time and energy to do this, and to do it well. It's another example of the way Argentineans are free to enjoy their lives, (no list of Sunday chores) and that they enjoy simple things like food and the effort it takes-to the fullest. "La Vida No Es una Pasta Frola"
If there was ever a quote to sum up the Argentinean perspective, this would be it. Loosely translated, it means "Life is not a piece of cake." I think anyone would agree with that statement-it's what we do with it that matters. Americans, eternal optimists as we are, grow up being taught that even when things are looking dismal, we should put our best face forward and act as if nothing is wrong. We've all heard: everything happens for a reason, there's a silver lining, life's a bowl of cherries...we keep smiling through the hard times, even with clenched teeth. The upside to this attitude-we believe in the possibility of our dreams, and that anything can happen. In many instances this is true! Argentineans, in contrast, tend to see the wine glass as half empty-life has socked them many hardships, and they've lived to tell about it. This makes many Argentineans expert complainers-politics, the economy, money (the lack of it) the job market-Argentina is ripe fodder for a pessimist. To say it another way, they are realists. They don't expect things to be perfect, because that's just not the way life is. It's hard, and that's no secret. On that note, Argentineans are also experts at enjoying life. They eat long lunches drinking wine and savoring their food, they take even longer naps, and surround themselves with family and friends. 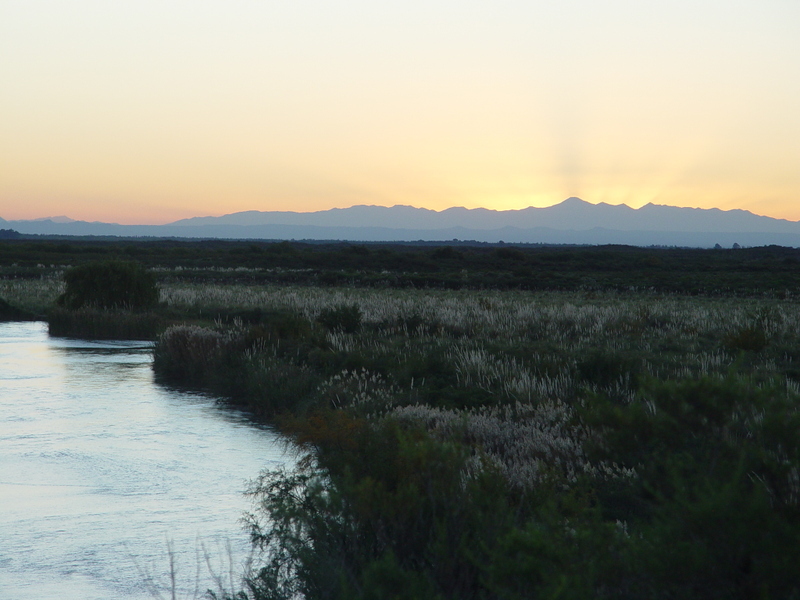 Argentineans slow down, they take it all in. No sense of urgency to get things done or to accomplish a task, as there is here in the US. "It" gets done when it gets done, and other things (like the aforementioned meals, naps and family) take priority. One of the things that makes life worth living for an Argentinean is food. Delicious, soul-satisfying food, eaten while taking a nice long while to taste it. I say this from the viewpoint of someone who will admit to having scarfed down food purchased at a drive thru window while driving maniacally to get something done. Life may not be a pasta frola, so with all the arrows it shoots our way, isn't it better to slow down and enjoy?! Pre-heat the oven to 350 degrees Fahrenheit. 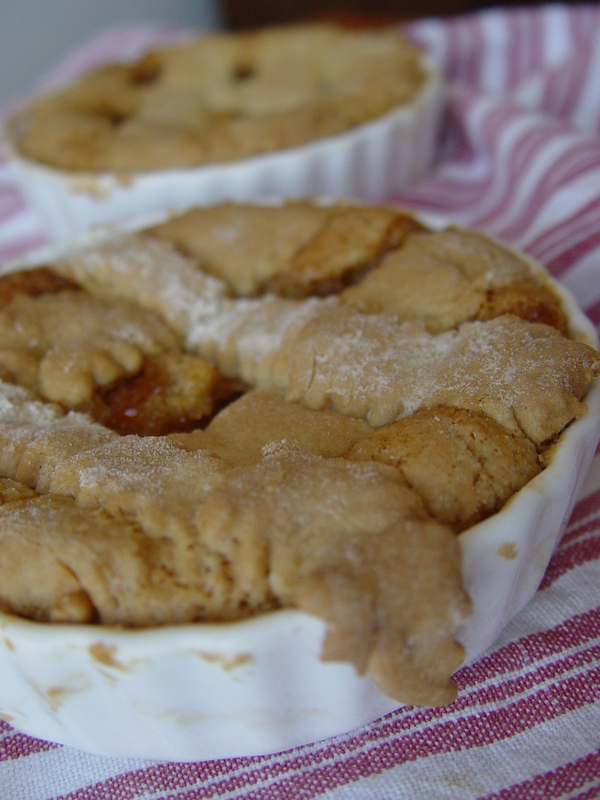 Butter and flour your pan-this recipe makes enough for a small square or rectangular pan, though the photos show small ramekins, which is also fine. Mix together the flour, sugar, baking soda and baking powder. Cut the butter in, mixing between your fingers to incorporate the flour mixture and the butter. Keep mixing until it's uniform and resembles coarse sand. Add the egg and 2 tablespoons of the milk and mix together until you get a ball of dough that is uniform. It should not be too dry (crumbling apart) and should not be sticky. Roll out the dough onto a floured surface. The dough should be about half an inch think. Cut the dough and put it in to the pan. It should cover the bottom and go up on the sides only a little bit. Pat the dough down around the edges with the back of your fingers. 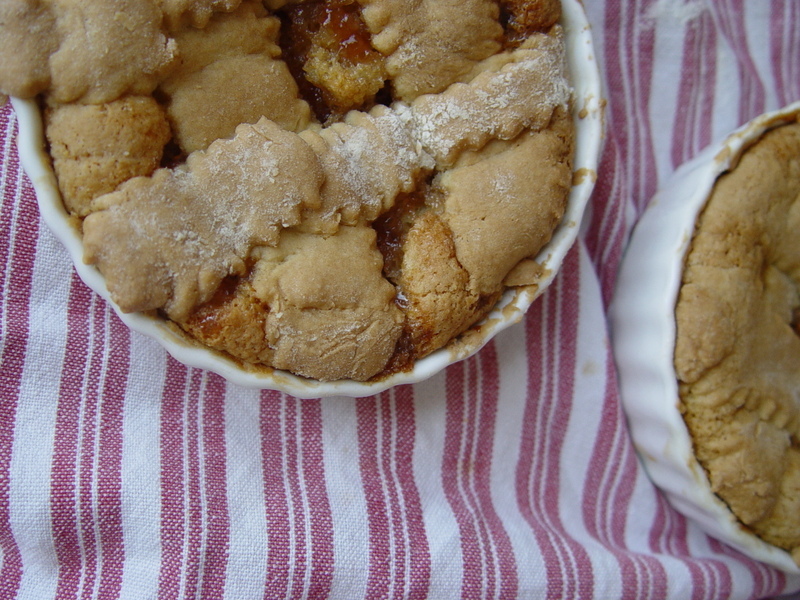 Take a few spoonfuls of quince jam and spread it over the dough in the pan. I have found that it's easier to mash the jam in a bowl with a fork so that it's easier to spread. Also, if using quince paste, you may need to add some warm water to soften the paste texture. Roll out the dough scraps and cut into strips with a pastry cutter or knife. 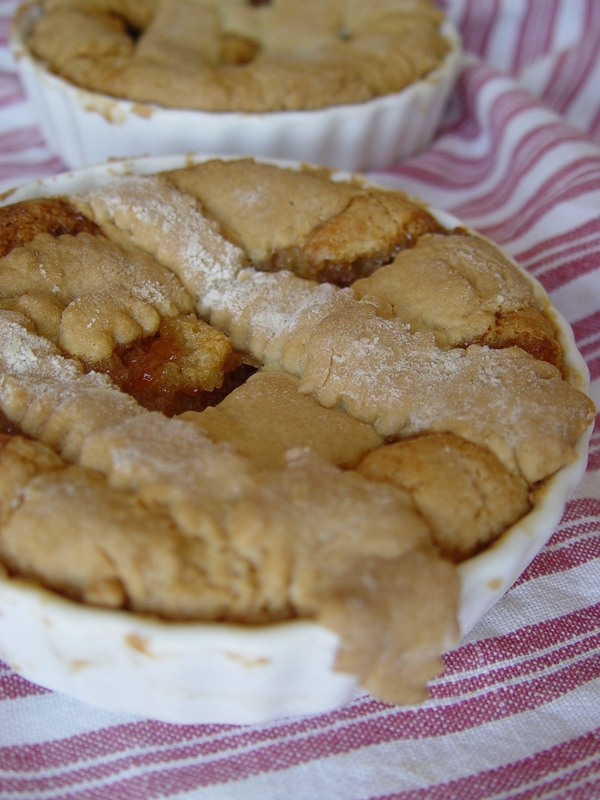 Lay across the top of the jam and dough in a lattice (criss-cross) pattern. Pop into the oven for a very short time-only about 20 minutes. It should be slightly browned on the top. We just got back from three weeks in Argentina- it was glorious! We had sunny days full of the warmth that only comes at the end of the summer, punctuated by crisp nights that say "Fall's just around the corner !". We ate late lunches, and with afternoon wine seeping through our veins, took long siestas. Later, we would go out on my husband's old dirt bike, blazing along the dirt roads outside of Bowen, leaving a cloud of dust flying behind us. We passed walls of sky-high poplars and rows of grape vines waiting to be harvested. Grasshoppers snapped against my legs, jumping up to escape the bike's path. Rogue dogs chased us down the road barking; we waved to kids riding on bicycles and old farmers as we whizzed by. Our trip was a much needed break, and we have returned feeling refreshed. But it was also very hard to come home again, as anyone who has spent time in another place (and fallen in love with that place) can attest to. The weeks flew by so fast! In that short time we adjusted so easily to being back in Argentina, their customs, the way people look, move and act. I so often feel divided-with one foot here in the US, my home and country of origin, the other foot (and my heart) in Argentina. The best remedy for that is this blog-I can't wait to share all the wonderful experiences of our trip with you!